The Westminster Abbey museum is a great attraction and one of the most prehistorical parts of the Abbey. Westminster Abbey is a historical experience for all tourists visiting London. Located to the west of the Royal Palace of Westminster the Abbey is a living church where worship still takes place and has been for the last seven centuries. It is a treasure of coronation and burial sites for the English monarchs and the St Edward’s shrine are at the heart of the Westminster Abbey Church – surrounded by the tombs and memorials of great men and women who made British History. Westminster Abbey provides tourists with more than 1000 years of wonderful treasures such as stained glass & textiles, Gothic architecture, and paintings. Within the Abbey grounds, tourists can visit the Church of St Margaret a parish church of the House of Commons in London. Visit the Chapter House and Pyx Chamber originally used by Benedictine monks for worship. The Abbey museum is a great attraction and one of the most prehistorical parts of the Abbey while walking through the Abbey gardens enjoying the peaceful settings where monks came for spiritual comfort. The Abbey offers visitors with various kinds of tours from individual audio tours to guided tours for large visitor groups. Visit Westminster Abbey for tours available in your language from French, Italian, Russian, Japanese, Chinese, German, and Mandarin. Come and relax at some of the surrounding places and enjoy something to snack or drink or pay the Abbey shop a visit and buy some presents for the family back home. How to get to Westminster Abbey? 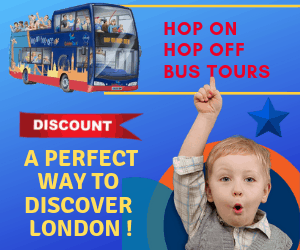 Before reviewing the following information to find out how to get to Westminster Abbey, we like to remind you that if you already have the Hop on Hop off ticket, you don’t need to be worried about your transfer to Westminster, because simply when you are on Hop on Hop off Bus, just take off the nearest stop to the Westminster Abbey. By Underground (Tube): The closest underground lines at St James Park and Westminster while the closest national train stations found in London Victoria and London Waterloo. To plan your way to Westminster Abbey use the Journey Planner.